When news of the Great Rift spread across Newerth, every citizen—Man and Beast alike—trembled at the thought of the gateway expanding into that bleak and ruthless realm. Every citizen, that is, except Merrick. When everyone’s favorite goblin shopkeeper heard of the vast alien wasteland, only one thought crossed his mind: Franchise! Though it pained him grievously (much worse than any fleshwound those heroes suffered upon the battlefield, surely), he drew a Portal Key from his warehouse, decreasing his stockpile by one but not gaining a penny of profits, and teleported to the slopes of Krula with a new shop sign tucked under his arm. He waved to Valreia the Riftwalker, who sat slumped against a rock with pages from ancient tomes scattered at her feet. Some of them seemed to be torn to shreds, and Merrick made a note to himself: Valreia may need glue. He brushed past the hideous purple tentacles slithering through the black maw to drop their darkness-spewing stalagnights in Newerth, then nudged his glasses higher on his nose and held his breath as he stepped into the Great Rift. Merrick had no notion of what the Great Rift would be like. If the environment proved too hostile for lingering, he would plant his shingle to stake his claim and hurry back to the relative safety of the slopes above Hell’s Keep. But other than a darkness thicker than the gruel those Berzerkers preferred, it didn’t seem too bad. Goblins could tolerate much worse. He planted a Ward of Sight (another expense he mourned) and found himself in a jagged, purple-tinged landscape. The giant stalagnight tentacles slid in and out of bottomless craters, which Merrick skipped over as he searched for a prime location. Ahhh, what was this, now? At the edge of his Ward’s glow he saw a vertical shape, crafted not by the severe nature of the Rift, but by hands and tools. Had another enterprising shopkeeper beat him to the choicest real estate? Merrick saw no other creature around, goblin or otherwise. He approached the structure, which seemed to be made of a large wooden plank and dozens of pegs, aligned in vertical rows and evenly spaced across the facade. Merrick felt something smooth beneath his foot. When he lifted his large green sole he found a stack of paper chits, some kind of receipts or notes, half-buried in the Rift’s soil. He plucked them free and cleaned them off, then realized more were scattered all around him, covered in layer upon layer of dust. Merrick stepped closer to the wooden structure to collect more tickets, and when he was within arm’s reach a row of colored bulbs sprang to life along the top of the frame and a series of bells chimed a merry greeting. A wooden tray at the bottom of the board showed paintings of different items. They must have been products of the Great Rift, for Merrick did not recognize many of them. One looked like a giant eyeball washer, which he had no need for. But next to that was the unmistakable shape of an open treasure chest, and they were not called treasure chests because they contained garbage. This was turning into a grand trip indeed! The wooden tray had slots carved into its lid above each pictured item, and the slots aligned perfectly with the lanes of pegs on the board. The shopkeeper’s mind worked quickly, and he realized why no one manned this contraption—it was an automatic storefront! An opening on the side of the board glowed, and there appeared to be a button below it. Merrick touched the painting for the treasure chest, then fed his tattered tickets into the opening until the button lit up and showed the word “Drop!” inscribed upon it. He peered into the shifting darkness above his head and saw nothing. Still, when he pushed the button he leaped to one side. Nothing landed on him. Instead, a small disk released from the top of the wooden board and shot down the lane above the treasure chest. It dropped through the slot and a moment later an actual treasure chest appeared at his feet. Merrick’s hoot of joy carried deep into the Great Rift. He tried each item on the tray, and with every drop of the disk the chosen item appeared before him. The multiple treasure chests he kept for himself—to cover traveling costs, of course—and the unidentifiable items born of the Rift, he set aside for the next lucky traveler. 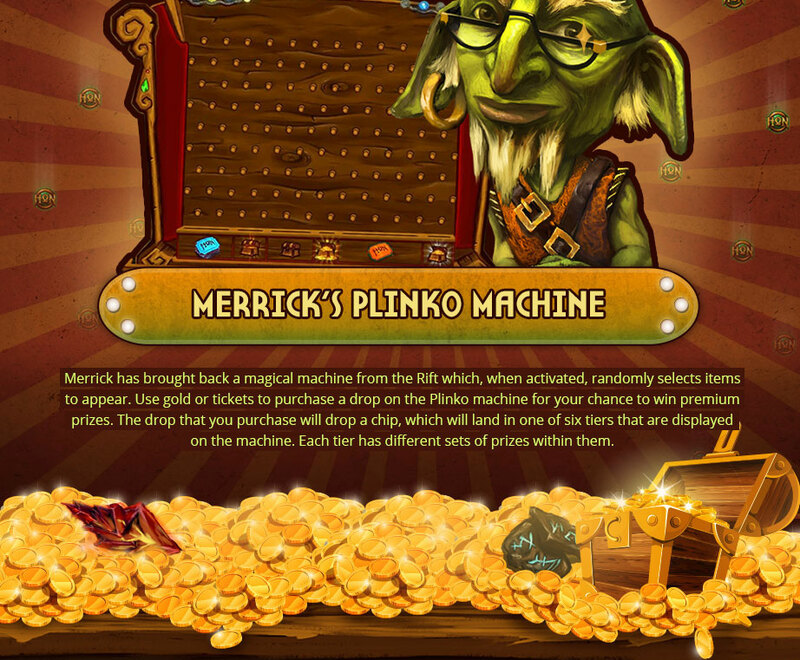 Not as lucky as Merrick, however, because he dragged the wooden board back to the portal that led to Newerth and transported it and as many tickets as he could carry back to his shop. Now, brave warrior, you may assume our great shopkeeper was only acting to benefit himself. Not true! While it brought him great joy to know endless treasure was only a button-push away, what made him even happier was knowing he would be able to better serve his customers. Now they could purchase whatever they liked, whenever they liked, and he would not need to be present! The notion of a much-needed vacation on the isles of the Inner Sea made Merrick rush to set the board up in his shop, and it wasn’t until he finished and stepped back that he noticed something odd. The wooden pegs were no longer aligned in straight lanes; now every other row was offset. Merrick pushed and kicked and pried at them, but the pegs would not budge. Had they shifted during transport? No, he had been very careful with this precious cargo. Merrick had the suspicion the pegs had realigned as soon as he crossed the threshold of Newerth, and that only in the Great Rift would they go back to straight runs. This notion was reinforced when he saw the items on the tray had changed as well. 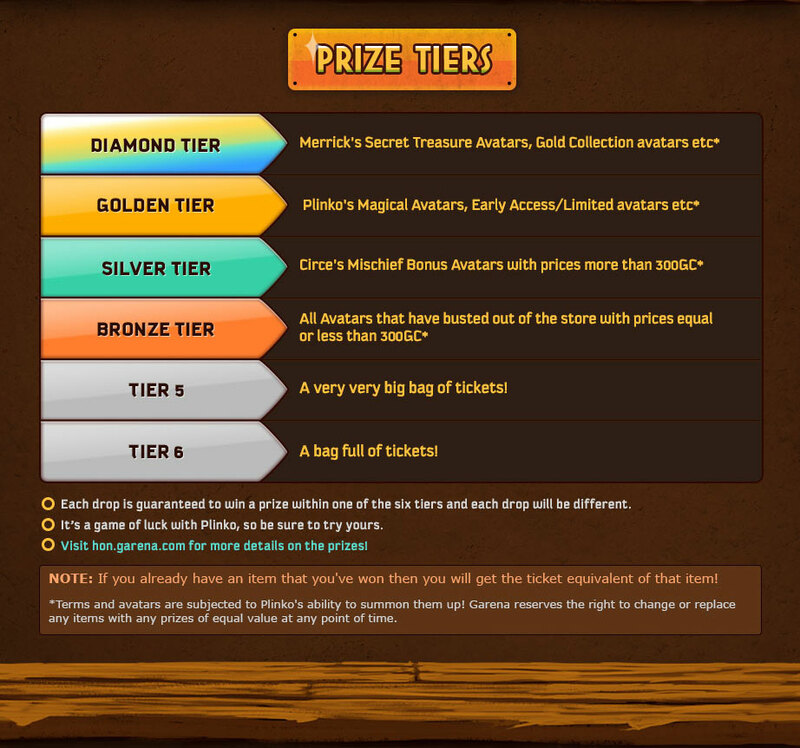 The treasure chests were still there, but the Great Rift items had been replaced with images of blue and orange tickets. That could not be the result of careless jostling—only sorcery or interdimensional shenanigans would cause such a thing. But did it still work? He touched the richest-looking treasure chest, then reluctantly fed gold from his new riches into the board and pressed the Drop! button. The disk released and fell, and was immediately bounced off track by a peg. It ricocheted left, right, even up, before finally dropping into the slot above the blue tickets. The board dispensed a handful of tickets into Merrick’s palm. He tried again. The disk took another random route, even though he’d again chosen the prime treasure chest, and eventually dropped into the slot for the second-tier chest. “Not too bad,” he muttered to himself. Then an Apprentice’s Robe appeared before him. Merrick rushed to his inventory and found he was short one Apprentice’s Robe. The board had stolen from him! He immediately tried to drag the board out of his shop so he could burn it. It would not move an inch. He hacked at it with a Logger’s Hatchet and didn’t leave a scratch. He slammed and barred the doors to the room in which the board stood. He hung two padlocks from the doors and nailed them shut. >He went home that night and dreamt of his poor, abandoned vacation, and when he returned to his shop in the morning he found a crowd of customers huddled outside his storefront. They cheered and howled with excitement. Merrick nearly fainted. He rushed through the gaggle and found his locked doors shattered into splinters, blown out from within. The board and whatever powered it had freed itself! Merrick peeked through barely-parted fingers as an archer fed tickets into the board and punched the button. The disk fell, bounced, and dropped...into the slot for the top-tier chest. The archer and his comrades cheered, and Merrick kissed his treasure goodbye.